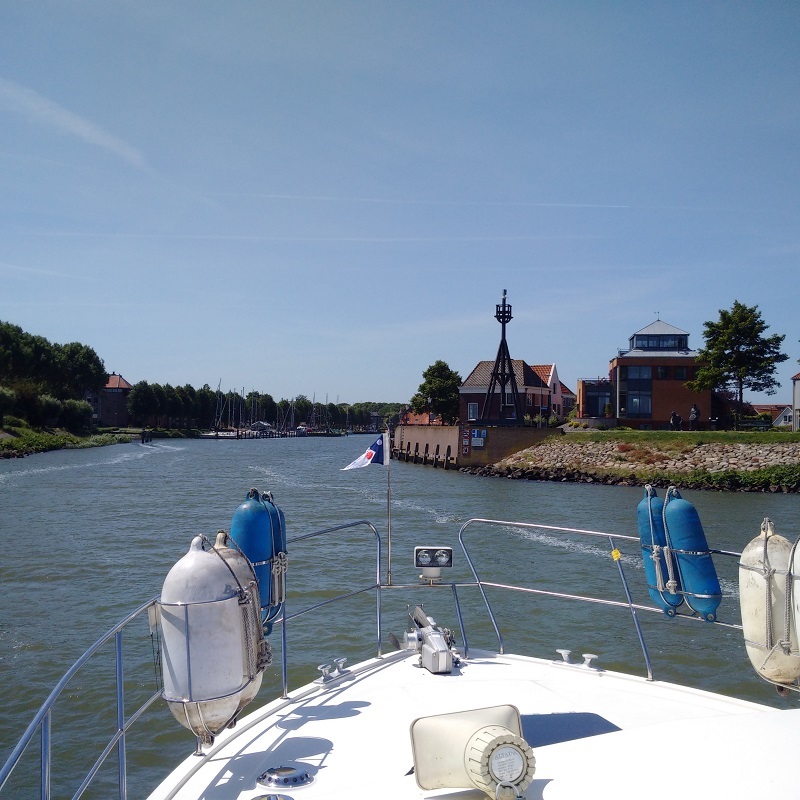 We managed Lady Martina’s cruise into the exposed part of the Ijsselmeer and round the coast from Enkhuizen to Medemblik in a Force 4 with wind speeds up to 15 knots in a beam sea. 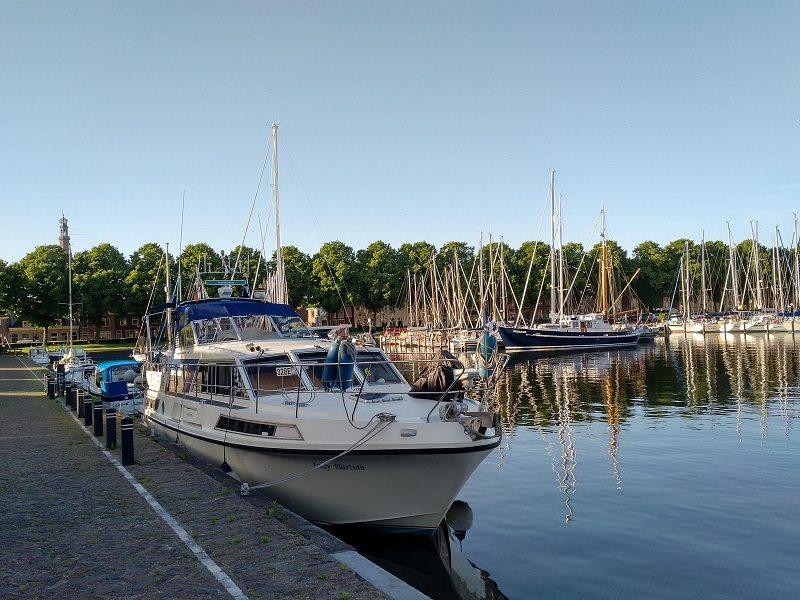 I had checked the weather in the harbour office and also on-line and we were expecting Force 4 winds of 10-15knots from the north-east and so I was going to treat this trip across the Ijsselmeer as a sea trip and make the necessary precautions accordingly. This meant dropping the folded bikes through the forward hatch on to the bed for safety and rolling up the sun ‘porch’ canopy as well as stowing all fenders and ropes, securing windows and removing everything from surfaces. In the end, the passage was not too bad and the seas state was mostly slight but the precautions were proved necessary by the gusting of the breeze up to 16 knots over this shallow fresh water mere where the sea is often short and steep. Also you can never tell when they are going to release a 1-2 knot outflow which would have been against this wind. 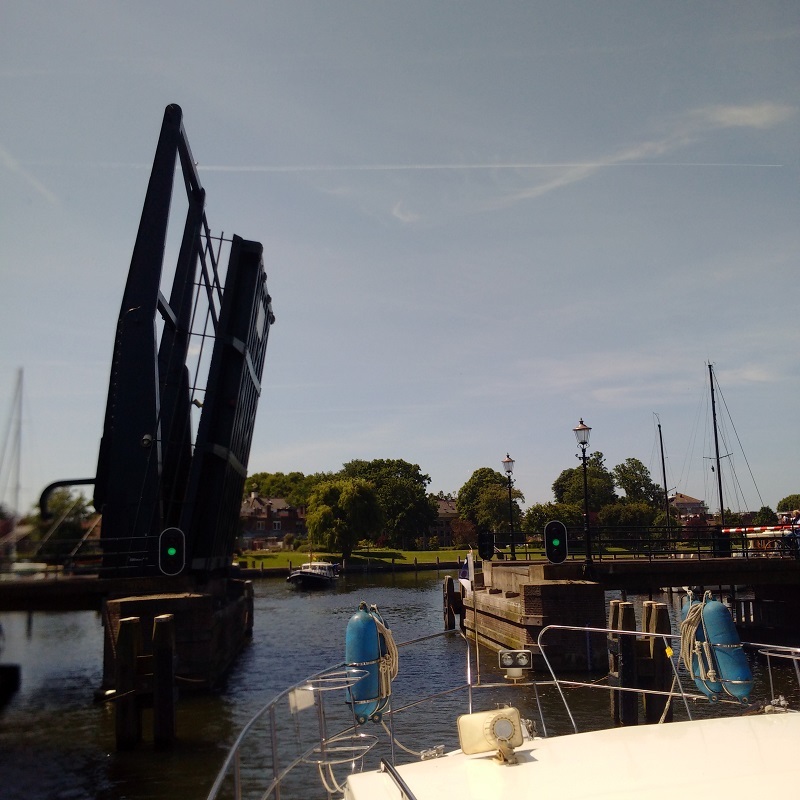 The entrance to Medemblik was very straightforward but I did take the precausion of calling on VHF 9 and got a good response in English. The Kwikkelsbrug closed on us but soon opened again as they no longer appear to be grouping boats together any more. I spend time reviewing the mooring pontoons, trying to work out which would be best for keeping our dog Max out of the sun, when the harbourmaster came over and suggested we moor against the quay at the far Western end and we were very pleased to do so as we could moor bows to the South and alongside a grassy area for Max. We unloaded our bikes and cycled to the harbour office where we found out that the harbour-master had been there for fourteen years; having started two years prior to my last visit in 2004, and that he had taken over from his father before him. I then took a cycle around Medemblik, bought a sticker and worked out where everything was and then. later on, I took Kathleen back to the town to visit the Bakers Museum; which visit we thoroughly enjoyed; the more so for her as she bought a dress from the shop next door!